Transition City | gURROO - A new generation of innovative minds. 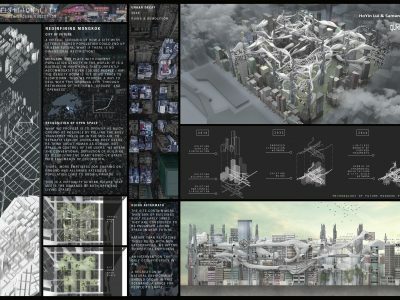 A virtual scenario of how a city of utterly packed population could end up in near future. What if there is no dimensional restriction? It is a district in Hong Kong that currently accommodates over 130,000 people per km2. The density boom is yet of no trace to slow down. 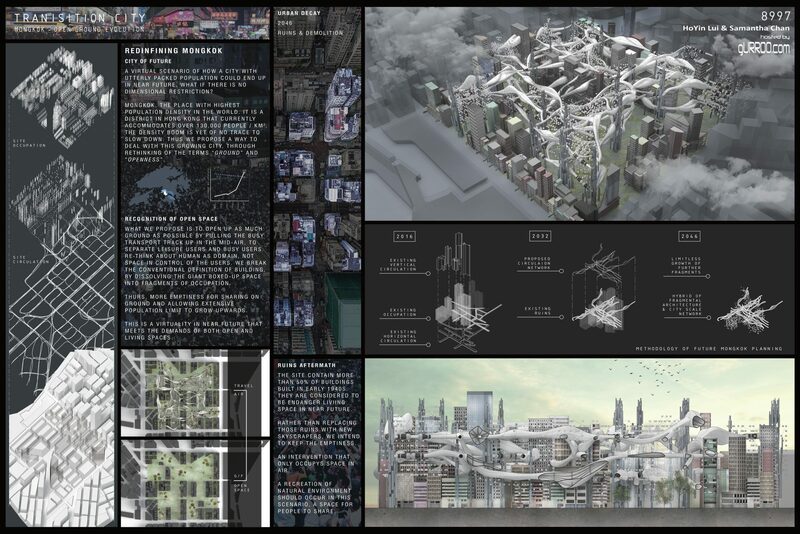 Thus we propose a way to deal with this growing city, through re-thinking of the terms “human, openness and ground”. In the past, people developed city with horizontality. Looking at those historical cities such as Rome, Paris, Beijing, Kyoto, etc, we notice a great effort in ground circulation arrangement. Plazas lead to social nodes, diagonal roads lead to city’s paces, broadness lead to flows. The circulation route was constantly in compromise with the living space enclosed in a building, which was on the ground level too. Ground used to control the living quality, citizens’ interaction, and thus their respective cultures. And that is why we can easily make a correct guess of a city’s personality with its figure ground. But is this the right direction we should head for in the future? Considering there is limited of space on ground. What we propose is to open up as much ground as possible by pulling the busy transport track up in the mid-air, so as to separate leisure users and busy users. Re-think about human as domain, not space in control of the users. 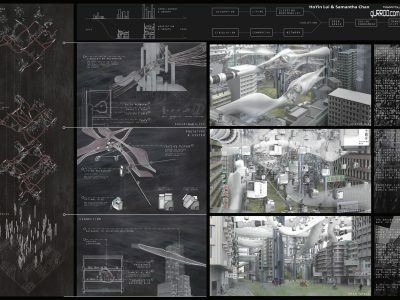 We restructured the conventional definition of building, by dissolving the giant boxed-up space into fragments of occupation. It would be convenient for adding and replacing space without demolishing the any living area in existing buildings. Thus, more emptiness for sharing on ground level and an increased extension of living in the sky, fulfilling the demand in space without ground limitation. 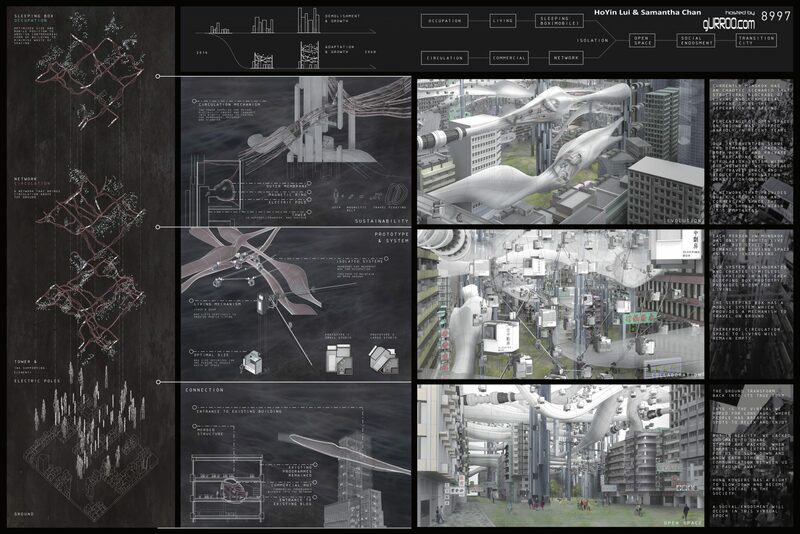 This is a virtuality in near future that meets the increasing demand of both open and living spaces.